Exclusive: ‘American Idol’ Fan Fave Charlie Askew Finally Speaks! 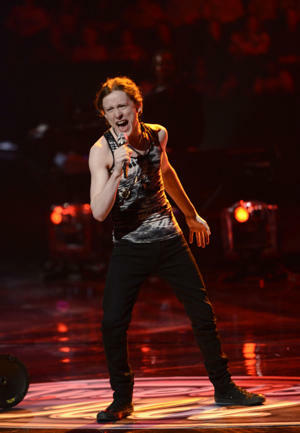 Charlie Askew was an early fan favorite (and my personal favorite) on “American Idol” this season, quickly amassing a devoted fanbase of Awkward Turtles with his quirky charm, theatrical performances, and weirdness-glorifying ethos. His exit from the show, after an unabashedly emotional (if polarizing and misunderstood) rendition of Genesis’s brooding “Mama,” was tough to take–and then the Turtles had to re-experience that heartbreak, when Charlie competed for a bonus spot on the Idols’ summer tour and didn’t make it through again. But really, if you think about it, Charlie was a top 12 contestant this year. If only this season had been formatted like previous seasons, instead of skipping straight to a top 10, things might have been different for Charlie–and for Season 12, which, frankly, has been a lot less interesting, and LOT less rocking, without him. Anyway, since leaving “Idol,” Charlie has kept a frustratingly low profile, leaving some concerned Turtles wondering if he’s okay after his rollercoaster reality-TV ride. But the good news is, he’s just been busy working on his original music–so “Blue Sky Diamond,” the self-penned song he performed on “Idol,” is just the first of many Askew tunes that fans will soon hear from this talented kid. And the equally good news? Charlie recently broke his post-show silence to about his “Idol” experience exclusively with Yahoo!’s Reality Rocks.